The New NIU Jazz Ensemble, formerly known as the NIU Jazz Lab Band, directed by Rodrigo Villanueva, is booked to perform this week at the House Café in DeKalb and next week at the legendary Jazz Showcase in Chicago. Shows at the House, 263 E. Lincoln Hwy., are scheduled for 8 and 9:30 p.m. Thursday, March 31. A donation of $5 is suggested. For more information, call (815) 517-0477. The Windy City gigs, at 806 S. Plymouth Court, are scheduled for 8 and 10 p.m. Tuesday, April 5. The cover charge is $10 for general admission and $5 for students. For more information, call (312) 360-0234. Special guests include NIU jazz studies faculty and alumni. Funds raised at the door will help the band produce its first live CD, which will be recorded April 11 at the NIU School of Music Boutell Memorial Concert Hall featuring NIU jazz studies faculty members Art Davis, Tom Garling and Reggie Thomas performing music by Herbie Hancock, Charlie Parker, Wayne Shorter, Dizzy Gillespie, Jerry Bergonzi, Chick Corea, Willie Maiden and Villanueva. The ensemble performs at least six concerts per academic year and participates in international jazz festivals and competitions. 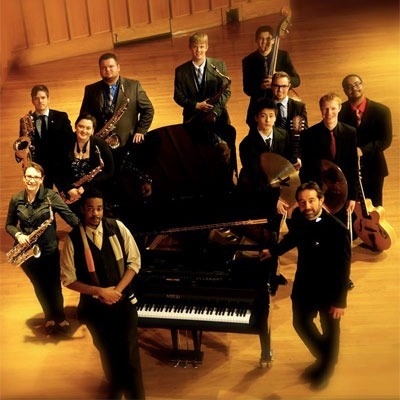 The group won first place in the College Big Band division at the University of Wisconsin Eau Claire Jazz Festival in 2008 and 2010. Under Villanueva, the ensemble has received outstanding recognition at various jazz festivals, including the Elmhurst College Jazz Festival. The group also got “Outstanding Performance” recognition at the 35th DownBeat Annual Student Music Awards (June 2012). In addition, during the winter of 2008, the Jazz Lab Band went on tour to Mexico for the first time, participating at the International Jazzuv Festival and at the International Festival of Jazz & Blues in San Miguel de Allende. In 2011 the NIU Jazz Lab Band recorded its first album “Quintessence,” and in 2014 the first DVD “Live at the 2014 Illinois Music Education Conference.” Villanueva believes that now is time to record a new CD that portrays this new phase in the NIU Jazz Ensemble’s voyage.